Mental and physical readiness to perform varies significantly from day to day. Some days are perfect for challenging your body and mind whereas on other days your focus should be more on recovery. When you balance your daily load with this essential data you can ensure optimal performance, stay healthy and even increase your physical and mental capacity in the same way that top athletes do to maximize their performance. With this knowledge in mind, founders at ŌURA set out to create an unobtrusive device that provides an accurate, long-term view on how your body responds to your daily rest and activity, and helps you make more educated decisions about your lifestyle to perform your best on a daily basis. ŌURA is an intelligent device that strives to provide a cohesive solution which is easy to use and fits seamlessly into the user’s life. 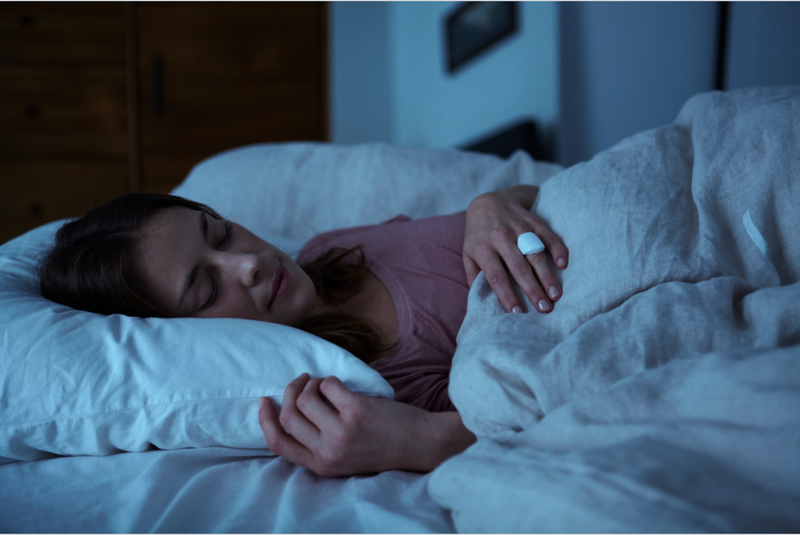 The device itself is a ring, connected to a smartphone app, that measures how your body responds to your activities and daily movement, and helps you identify how those things affect your sleep quality. It also provides the ideal daily activity target based on how much quality sleep you experienced the prior night. While other devices focus on getting you to move more, the ŌURA ring intelligently analyses your data and determines what you should be doing and how hard you should be pushing. It works by tracking the physiological responses of your body while you sleep, measuring your pulse waveform and heart rate dynamics, body temperature, and movement with research-level accuracy. 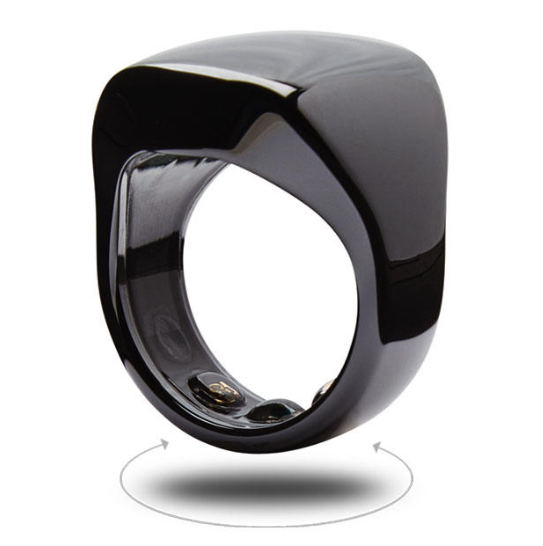 The ring monitors heart rate (HR), heart rate variability (HRV), respiration rate, body temperature, and movement while the user sleeps. Movement is measured during the day, as well as HR and HRV during moments of rest. According to ŌURA Sales VP Chuck Hazzard, "Our goal is to help our users learn how their body responds to their lifestyle choices and what they can do to maintain balance and perform at the highest level"
To this end, ŌURA recently introduced a view of nightly temperature trends to the app. Monitoring temperature trends can provide an insight into impending illness and can also offer women valuable insight into the status of their fitness and health. At least for women, monitoring temperature can help with training guidance for improved fitness and general health follow-up with automatic detection of nocturnal body temperature. Body temperature readings may also be used to track the phase of one’s menstrual cycle. In addition to the Readiness Score, resting heart rate, and nocturnal heart rate variability, a women’s phase within their menstrual cycle provides guidance for their training volume and intensity. More specifically, recent scientific studies suggest that women should restrict the amount of high intensity during the latter half of their menstrual cycle. Positive training adaptations can be enhanced by concentrating a higher proportion of intensive trainings within the first half of the cycle. A recent study focused on strength training and hormones in physically active women, and while it is clear how these findings transfer to aerobic training, it is also possible that the same principle applies to high intensity training in general. The ŌURA ring uses the minute-by-minute changes in skin temperature every night to derive the user’s average core temperature. The trending of this data over several nights provides valuable insight into the user’s health by comparing daily temperature fluctuations to your established baseline instance, consistent elevated temperature readings are often an early warning of impending sickness. Figure 1 below displays the temperature trend from the ŌURA app from a woman who is using hormonal contraception. She reported having a flu in early February when we see elevated temperature readings. The temperature readings provided by the ŌURA ring used in conjunction with other sources of menstrual tracking could help women keep track of the timing of their menses, and detect different phases of their cycle. The temperature graph could also help determine the timing of ovulation and a women’s fertility window. The general challenge with exact timing of the ovulation using temperature readings is that the elevated temperature is associated with progesterone hormone which increases after the ovulation. The second feature ŌURA has added is HRV. Although HRV has always been one of many contributors which make up your Readiness Score, the team at ŌURA decided to show it separately due to customer demand. The HRV number shown in the app is the average of all the five-minute samples taken while you sleep. By way of example, there would be 96 distinct HRV measurements for eight hours of sleep. To make HRV readings comparable to each other, it is particularly important to standardize the measurement with regards to the time of the day, prior activities and external stressors including ambient temperature, noise and presence of other people. Subsequently, nocturnal measurement provides an excellent measurement window. Also, long term data collection requires a measurement protocol which is easy to use and fits into your lifestyle. Most methods require the use of uncomfortable chest straps, which are not suitable for continuous use. Innovations such as ŌURA seek to personalize technology for greater intelligent analysis, so that you can make more informed decisions about your lifestyle and health. Many are predicting sleep and recovery analysis to be the next big wave in wearable tech, not only in wearables but in the health and wellness market in general. Says Hazzard, "ŌURA will continue to expand the accuracy and breadth of the data it collects. This data will then be combined with data-mining and machine learning to provide highly individualized guidance to the end user which is meaningful and actionable. This insight will allow ŌURA to become your personalized health coach." Click here to check out the ŌURA website.